There is no doubt that connectivity can contribute to strengthening co-operation and the sustainable economic growth in the OSCE area, said Azerbaijani Foreign Minister Elmar Mammadyarov. The 2016 Hamburg OSCE Ministerial Council decision on Strengthening good governance and promoting connectivity, as well as all relevant previous OSCE documents and decisions, provide a useful framework for cooperation in this regard, Mammadyarov said addressing the Promoting Economic Connectivity in the OSCE area Side Event in Milan Dec. 6. He noted that among the projects contributing to the increased connectivity is the Baku-Tbilisi-Kars (BTK) railway with a freight-forwarding capacity of 6-7 million tons at the first stage and its subsequent increase to 17 million tons a year. “The BTK is a key segment of the emerging transcontinental corridor, called New Silk Road, which will link trans-Europe and trans-Asian railway networks and will significantly contribute to a reliable and integrated freight railway connection between Europe and Asia,” he added. Given constantly increasing volume of trade, it is obvious that there should be a diversity of reliable trade routes – not in or competition with each other, but in complementarity to each other, said Mammadyarov. The minister stressed that another priority area of the Government of Azerbaijan is good governance in transport and trade facilitation, inter alia, through streamlining import, export and transit border procedures, introducing efficient trade formalities, which allow more transparent customs processes in transit and trade. “Particular attention is given to introduction of information technologies in trade facilitation such as e-declaration system based on e-signature principle,” he said. Mammadyarov expressed confidence that the OSCE extra-budgetary project on Promoting Green Ports and Connectivity in the Caspian region, which is ready for implementation and which will involve Azerbaijan and our Central Asian partners and potentially Afghanistan, will further strengthen connectivity between Europe and Asia. 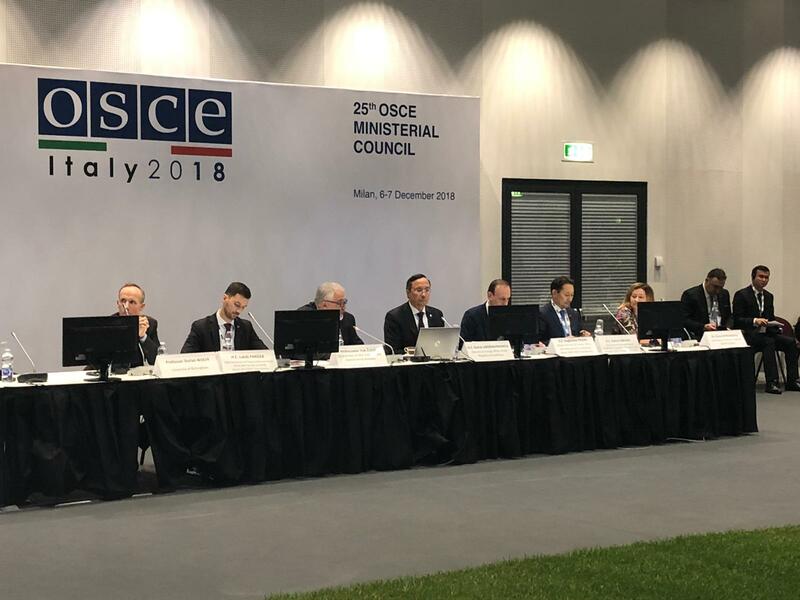 “Taking this opportunity, I thank Ambassador Žugić, Co-ordinator of OSCE Economic and Environmental Activities and his team for putting together this important project and call on all OSCE participating States to contribute to its realization,” he concluded.